Oxon Loop II - Flying around the Cotswolds! I had been looking forward to this run for some time, it was coming at the end of a quiet week off work: Life had conspired against me (who's paranoid?) to prevent me getting more than a few derisory miles under my belt on a bike. So when Saturday morning dawned I was a little down to see grey overcast skies above me. 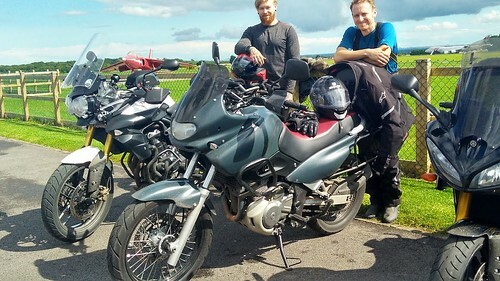 But undeterred I rolled out my trusty Thundercat and headed across Worcestershire to Alcester to hook up my old mate Stu who would be joining me on his BMW GS for the first leg. My Thundercat has just been treated to a shiny new Hagon shock, so I was eager to see if how the bike handled now. The roads over to Stu's are great, but to be honest the bike felt odd and wouldn't turn in...hmmm. Anyway lets get to Stu's and decide to check the front tyre pressure....24psi...opps. Added another 12psi and the bike was transformed. 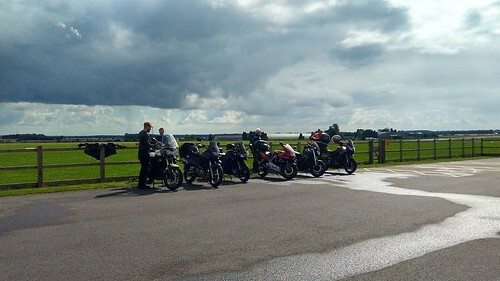 Stu and I made the short hop over to Wellesbourne and hooked up with the group once they rolled up neatly lined up behind Bob. 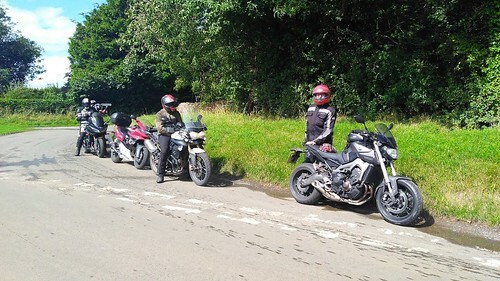 A sign of the times was that I was the only rider on a Thundercat although Ray had done some of the first leg on his, so were represented at least! 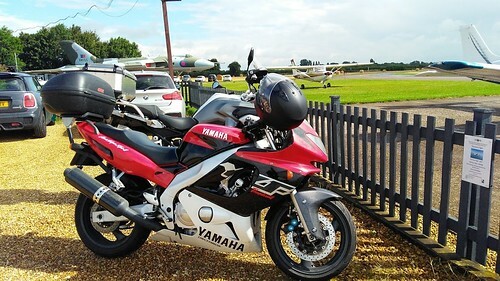 The cafe at Wellesbourne is a quaint little place and there are some interesting aircraft to see while you eat. In fact whilst we were outside enjoying a spot of salad all eyes were suddenly wrenched skywards in response to that most evocative of sounds in aviation...a V12 Merlin engine at full chat! 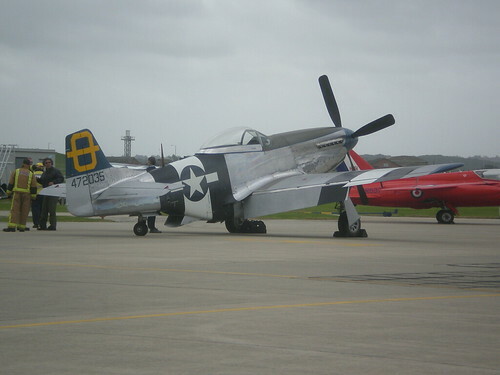 A P51 Mustang, swept low and fast across the airfield, not once but twice! Fair play Bob, the Oxon loop may not get 20 bikes like BC and WM, but you have got a flypast sorted!! Very, very cool, especially if you are into WW2 aircraft in the way I am! 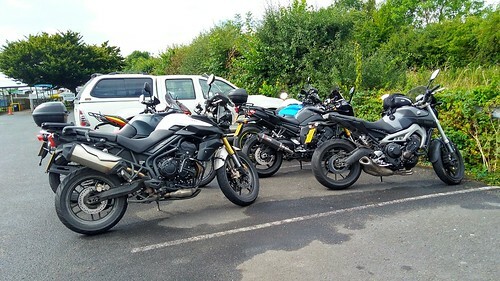 It was good to see some familiar faces again, Rob, Steve, Alex and new ones too like Robin who had ridden up from down south with Alex on his Triumph. 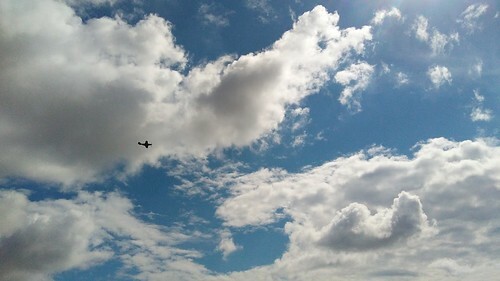 The P51 Mustang flypast, my hastily grabbed mobile phone picture really doesn't do the moment justice! A bit closer up! Not the actual P51 we saw, but just to give you an idea of how glorious they are! 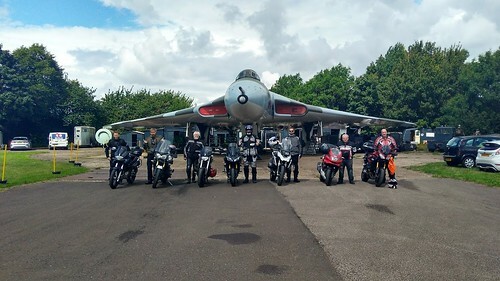 The aviation theme continued as before we set off for the next leg of the ride out we were allowed to line the bikes up under the impressive Cold War era Vulcan bomber that resides at Wellesbourne. in fact this is the one that Guy Martin was allowed to taxi a couple of years ago. 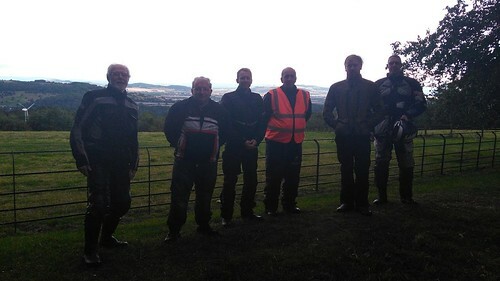 Back on the bikes and Bob on his recently acquired MT-09 led us across some very 'technical' sections. 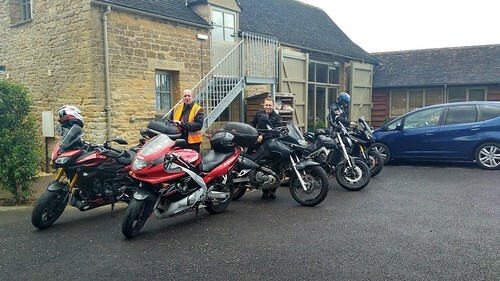 Speeds were not elevated, but the pace remained brisk as we passed through some fine Cotswold countryside and typical 'chocolate-box' villages that wouldn't look out of place in Richard Curtis film. It's the kind of place many Americans think we all live...The conditions were basically dry and the group was hanging together very well, with junction marking only taking moments before Steve on his Tracer popped into view. Highlight of the morning section was 'Fish-Hill' a well known piece of road locally. Fast, but with some really demanding bends as it snakes uphill pretty steeply. It was great to be part of a six bike line all tucked and neatly tracking each other. Alex on his 650 'Trapped Wind' was doing particularly well! My new suspension seems to be working well too, my bike feeling very composed and stable. Rob reported the bike looked very controlled too at various points on the ride. Pleased. We had a brief stop at Broadway Tower for the tradition Oxon Loop photo session before making the short hop to the rather excellent Cotswold Food Store and Cafe at Moreton-in-the Marsh. 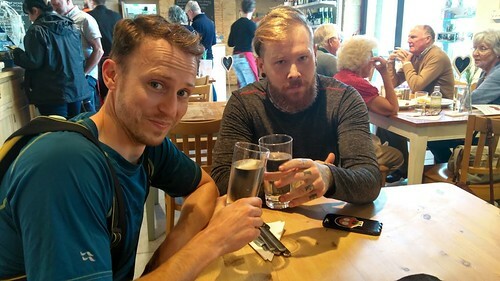 The food was excellent and most welcome and Alex inducted Robin into 'Team Lightweight' as they hit the cordial. Ginger and lemon Grass...I kid you not! The afternoon riding took in tight country lanes that were somewhat muddy in places as we worked our way across the Cotswolds. Again the group hung to together really well and Bob led in a very calm, controlled manner. 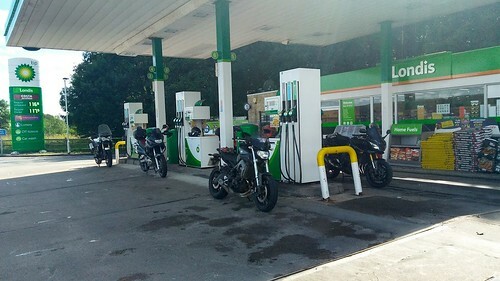 Even our petrol halt was very well ordered as 6 bikes neatly pulled into a petrol station with only 6 pumps, but everyone was vacant as though awaiting our arrival. On most of the group ride outs I have joined these little halts have caused bedlam! 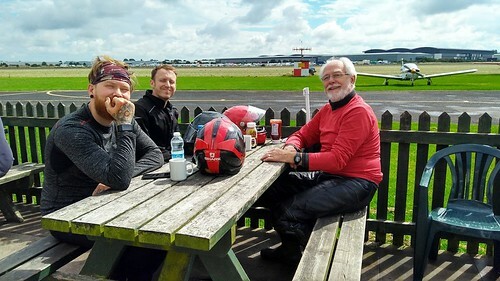 I stayed with the group as we made our way to the next rest halt, this time at the former RAF Kemble, now Cotswold Airport where many airliners go to be scrapped when they have reached the end of their useful life. The cafe was closed which was a bummer, but I was happy as a lark as there even more old aircraft to look at! From here I headed home, taking the cowards way out and blasting up the M5 in a bid to outrun the gathering storm clouds: I did have to duck into Worcester services to dodge one deluge! Costa...£2.69 for a cuppa!!! The Thundercat had not missed a beat all day, over 300km on the new suspension and all is good. Cheers to Bob for organising it all, Steve for taking the tail end Charlie slot all day and due respect to Alex and Robin for making the long haul to join the fun too. Rob also came out just for the day and it was a big days riding for him too. All in all a cracking day and I looking forward to Oxon Loop III already! Any chance of a Spitfire for the flypast next year Bob??? Re: Oxon Loop II - Flying around the Cotswolds! Great write-up, sorry I missed it (I was cycling 100 km along the Ridgeway). Just one thing though... it's Moreton-in-Marsh. Sorry, bugbear of mine having lived near there previously. Great write-up and photos Tony - thanks! Alternatively, if we do the run a couple of weeks earlier, we can make a couple of stops near Fairford for a free peek at the Air Tattoo displays. @bobh wrote: Great write-up and photos Tony - thanks! I didn't notice the other airfield Bob. I could be talked into wing walking if they could find a biplane strong enough to take my weight! The Fairford sounds like a bit of a plan to me! Great read and photos, sorry I missed the 2nd part of the ride but as you know the little boy's birthday took priority! I'll have a look at next year and be changing the meeting venue unless people wanted to meet at The Holt, but more information to come on that over the winter period. @Ondurin wrote: Great read and photos, sorry I missed the 2nd part of the ride but as you know the little boy's birthday took priority! Looks like you all had a blast this year too.